Though I read The Hunger Games Trilogy, I have yet to see the movie—just because I haven’t found time. I’m thrilled that the reviews are so good, that all this anticipation won’t be for naught. I am also desperately relieved—unlike some on the Twittersphere—that a black child (the impossibly cute Amandla Stenberg, who is actually biracial) was cast in the role of Rue. Reading the books, I cried when Rue died in the first book, bawled in the second book, when Katniss visits Rue’s district and has contact with the child’s family. I imagined Rue black, not because I am black, but because Suzanne Collins told me she was. (Or implied it and later acknowledged that this was her intent.) In fact, because Thresh, who is not related to Rue, is also described as having dark skin, I was under the impression that most of District 11 was black. When I learned that there was a film in the works, one of my first thoughts was: will the casting reflect this description? “If it’s supposed to be you, Mommy, why does the mother in the story have brown skin too?” Meaning, why wasn’t Lisa’s mother white, like Grandma? I responded that it was 1968, and back then, it was easier for people to accept children being the same color as their parents. I didn’t hold the publishing industry of the 1960s to such a high standard. But when I hear people of all races talk about Corduroy the thing they say most is: That was my favorite book as a child! Or That’s my children’s favorite book! 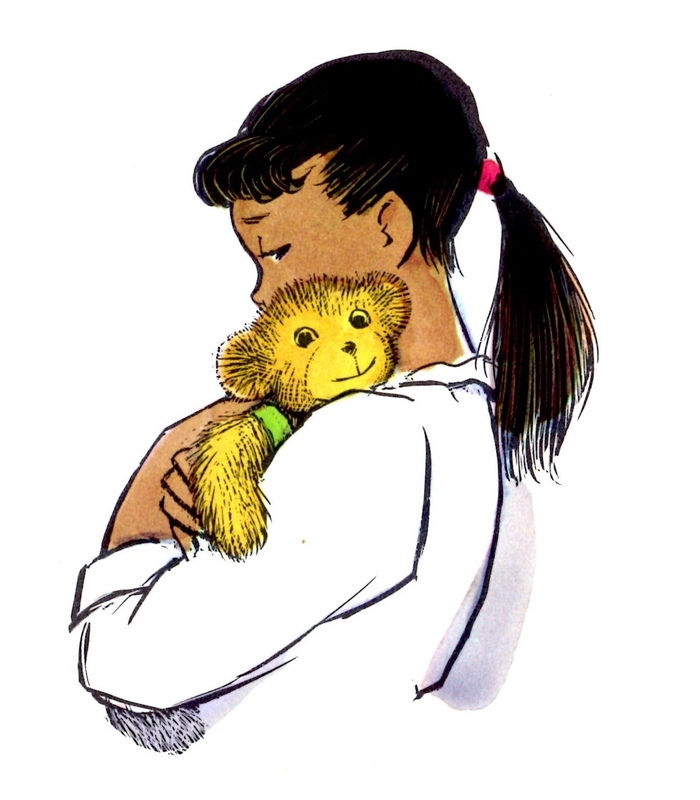 Everyone loved Corduroy and the little girl who took him home—regardless of the fact that she was not white. What Corduroy proves is that audiences connect with characters who look different from them, as long as the story is genuine and the feelings are familiar. I believe the same is true for The Hunger Games. Rue would be compelling in any color, though the author envisioned her brown. I wonder if viewers of the film expected Rue to look like Prim, since Rue reminds Katniss of Prim (and Prim is described in the book as fairer than Katniss). But it is Rue’s youth, sweetness and innocence that touches Katniss’s heart–the fact that she is dark does not dilute these qualities. And speaking of Katniss, what about the casting choice of Jennifer Lawrence, a blue-eyed blond, playing the role of a girl the book described as having olive skin, dark hair and eyes? (More like Naya Rivera, who plays Santana on Glee . Granted, for the role, Lawrence dyed her hair a little darker.) Was there a moment when the film was being cast, when people said, okay, what race should Katniss be? What went into the decision to make her white? Or was it was always assumed that she would be white because this was going to be such a huge film, and having a white star seemed like the most marketable choice? Actually, Katniss’s race wasn’t a big deal for me; many white people have olive skin and dark hair anyway. What would have been a big deal—what would have smacked of deep cowardice—would have been casting a white actress for the role of Rue. That would have sent the message that: no matter what the writer’s vision was, Hollywood could not expect an audience to weep for a black kid. It is growing more common in films and on television to cast people of diverse racial backgrounds in mainstream roles without anyone making a big deal out of it. For example, in Bridesmaids, the protagonist’s best friend Lillian–who was the bride herself—was clearly biracial. She was played by Maya Rudolph, a biracial actress and comedienne, and in the film, she had a clearly black father and clearly white mother. I loved that no one mentioned race in the film. It was just there, and no big deal. Is that reality–race being no big deal? No, but what a wonderful wish. If Hollywood perpetuated that fantasy more—rather than ramming stereotypes down our throats, I wonder: would those stereotypes begin to dissolve? When I first read about these reactions, I clicked the red X, closed the page, closed my ears and eyes because I did not want to be reminded that anyone in America felt this way. That anyone in America would feel less sad if my daughter died than if a white child died. (The Trayvon Martin case is staring us all in the face as I write this.) I know that I live with a certain amount of healthy denial; possibly I am giving Americans too much credit. But if I am, then so was Suzanne Collins when she made Rue a dark skinned child and then dared us to care; so were Gary Ross and Debra Zane (the film’s director and casting director respectively) when they cast Stenberg as Rue and Dayo Okeniyi as Thresh. (And I love that Lenny Kravitz, a biracial, black, Jewish guy, was cast as Cinna, whose race is not mentioned in the book!) It should be no big deal. Does someone have to be like us for us to care about them? I really hope not. This entry was posted in Cultural Context, General Identity, Interracial Marriage, Loss, Moms and Daughters, multiracial identity, Parenting Biracial Children and tagged Amandla Stenberg, Biracial, Corduroy, Diverse Backgrounds, Hollywood, Katniss, Lenny Kravitz, Marketing, Rue, The Hunger Games, Twitter. Bookmark the permalink. Awesome post. I haven’t seen “Hunger Games” but I have read Corduroy. I like your references to current events and culture and the links you provide. Engaging read as usual ;-). Thank you Laura, I appreciate the feedback! Very interesting Lisa!!! You encouraged me to read the book! A very interesting post. I love the Hunger Games trilogy and highly reccomend the movie and I loved Rue as well. What I found most interesting about this blog entry though was the story of you and Cordoruy, who I loved as a child! That is a fabulous story! Lisa, What an amazing story! A gem. But I feel as though you buried the lead, that being that you are THE Lisa in the Corduroy books! First of all I had no idea that Corduroy book came out in 1968! I was already 13 then, but I feel like I grew up with that book. It is one of my favorites, and I read it so many times to my children. It is such a comforting, wonderful book and what an honor for you to have inspired it. And back then with so many children’s books featuring white children, I loved that Lisa was black. Another great book was The Snowy Day by Ezra Jack Keats. But, for the most part, seeing children of color then was rare. Now, you’re making me think I should read the Hunger Games. I haven’t seen the films yet, but am certainly curious. So glad I stopped by today! Thanks for the comment Monica. I had The Snowy Day too, and Whistle for Willie–also by Ezra Jack Keats. My dad always got free children’s books because he worked for Viking. Any books that had children of color he made sure to get. Umbrella and Momo’s kitten were by a Japanese writer whose name is escaping me. They featured Japanese American children and took place in CA and NY. Nikky, thank you so much for sharing it. I am not familiar with bookwitch and will check it out! Lisa, this is the most inspiring story! Corduroy was my favorite book growing up and I’m so excited that my mom kept it all those years because now it’s one of Sophie’s (my daughter) favorite books too. That story has always had such a profound impact on me. I love that Lisa loves Corduroy, with his flaws and all. I’ve felt that it’s a book that teaches so much. And I love that you were Lisa and how fascinating it is that Zoe picked up on the race relations nuance even as part of a simple children’s story of acceptance. If I could send you my book, I’d have you autograph it for us. Thanks Leah. I’m so glad to hear that Sophie loves the book too. It does have so many teaching layers. My kids also loved it, though when he was very small, Theo was really frightened of the night watchman. I had to skip that part! Poor Theo! I can see that. Sophie gets very concerned about Corduroy making it safely back downstairs. Shows they’re empathetic kids, I guess. Good morning, Lisa! I just had to give you a shout out in my post today. Please check it out! Lenny Kravitz is a devout Christian, but, ok. So he is–just checked. However he wears a star of David along with his cross and openly acknowledges his Jewish ethnic heritage. This was such a great post! I had always assumed Don Freeman must have been black, and was surprised when I saw a picture of him. So then I was curious to find out why a white male would have written a book with a black female protagonist. I love the books even more now, knowing that Lisa is a real person! Thanks for the comment, Amy! I bet a lot of people wonder the same thing. Also, if you ever find Don Freeman’s Hattie the Backstage Bat, you will see a black guy in the center of the drawing of the audience. It’s my dad! So, today there wouldn’t be a book about a black mother and her child even though interracial families are still the exception rather than the rule? This made me very sad, as a black girl with two black parents. Maybe the story is just about a black family, is that wrong? Sometimes I think that we go to far when we imply that interracial is better than non-interacial. Personally, it meant a lot to me to see a black child and her black mother, a very common type of family. I imagined that there was a father at home growing up, but maybe there wasn’t–or there were two moms. I just love this book so much and your comment just hurt me a tiny bit. I accept that many children are the same/similar color as their parents today, and that’s okay. Hi Saara. Thanks for commenting. I think you misunderstood what I meant and I am hoping to clarify. First, off, I think all loving families are beautiful whether they are interracial or not. Of course, there are–and should be–plenty of books which depict black mothers with black children. I don’t know how you got from my statement to your point, though maybe I left the thought incomplete and open to interpretation. You are right: interracial families are the exception, not the rule. The only difference is, nowadays people are less likely to look askance at interracial situations than they were in 1968. I am sorry that what I wrote made you sad, though at no point did I mean to imply that non-interracial families were passé or inferior. Far from it. Remember, no one questioned my connection to my father, who was black, so I had the experience of ease that went along with “matching” a parent. It would have been nice, though, and validating to have just one book where the mom and child looked different. Pingback: My Teddy Bear | The Loudest Librarian! I, too, loved Corduroy as a child (and as an adult). Some of that might have been that my name is Lisa also, but I think most of all I simply love stuffed animals (and real ones!) and often gravitate to those who are a bit dinged up and in need of extra love. My husband had a rough childhood and missed a lot of experiences like the standard kids books, so we often go to a bookstore and I’ll pick out some classics so we can catch up on them together. It was a big deal day when I showed him Corduroy. He made the astute observation that it was very like a good relationship — you love someone despite any external imperfections, and in a way that love inspires the other party to want to be a better person, even though it’s not required. “I like you the way you are,” Lisa said in the book. I also think I enjoyed it because the heroine was black and that seemed unusual compared to most of the books I read, but it really fit my environment. Growing up in the South, I was one of only 4 white children in my grade, and for many years most of my friends were black, so I enjoyed stories with characters that fit my life experience. Ironically, my best friend is a librarian who *ordered* me to read The Hunger Games books, and yet she’d also missed a lot of kids books growing up, so I made her read Corduroy in return. In the end, maybe it really all comes down to little dark-skinned girls with tender hearts. Lisa, Sorry I took me so long to get back to you! I’ve been off my blog for a while, finishing a project. Thank you so much for reading, and for sharing this experience. Hi, Lisa – I stumbled on this article while poking around for background info on a piece of my own, about my parents’ commitment in my childhood years to provide a wealth of books featuring young black characters as their protagonists. (I didn’t fully realize until my adult years that this had been a pro-active effort on their part, that my supply of children’s literature was a little different from most other kids’.) Of course, your namesake jumped to mind (what a charming story! ), along with a sizable array of less familiar characters. But it opens the door for me to ask one question that’s nagged at me for over 40 years, which you might have some inside scoop on: WHY DOES LISA LOOK EIGHT OR NINE WHEN SHE’S OUT SHOPPING, AND THEN SUDDENLY MATURES INTO A 13 YEAR-OLD ONCE SHE’S IN HER ROOM AT HOME? Hi! You know, I noticed this too. Here’s my best guess: in the beginning, where she looks very young, Cord is on the shelf and inanimate and he looks smaller too. They are surrounded by big adults, who pretty much dwarf them. At the end of the book, when she’s running up the stairs, she looks long and tall compared to Corduroy. There are no adults around for comparison’s sake. It’s def a little girl room though. 🙂 Hope that helps a bit. Thank you for reading and commenting!